Chesley Wilson is a true national treasure. He has maintained a genuine Apache tradition that has died out almost everywhere else. He learned how to make the Apache violin from his relatives in Bylas, Arizona (about 50 miles from Globe). Ever since he has tried to keep the tradition alive. He has been awarded many state and national prizes. I had the great privilege of taking a workshop from him in March 1997. I learned how to make the Apache violin, as well as Apache cane flutes. I should also point out the Mr. Wilson is a direct descendant of the famous White Mountain Apache chief Hashkéé Dasila, and also of the Aravaipa chief Eskiminzin. 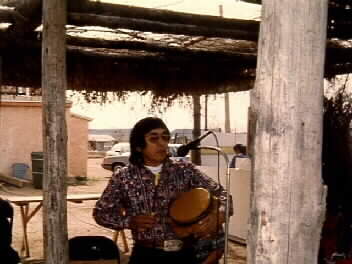 This is a picture of Mr. Wilson playing at our "concert" near the San Carlos Apache Cultural Center. We had a great time!